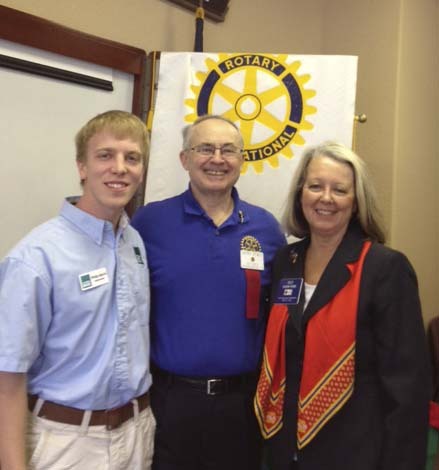 On February 1, 2012, Phillip Daniel Harris and Suzi Howe spoke to the Rotary Club of Friendswood at their regular meeting. Phillip described the Rotary Shelter Box program, using photographs from many different destinations. For example, he stated that the shelter box purchased by our Club was sent to Kenya! He noted that boxes have been sent to help people who have lost everything in different parts of the world, including the USA. Phillip ended by talking about the plans for the program for the future, hoping to serve 500 million people every year. Suzi is the Rotary Zone Coordinator for Polio Plus. She reiterated the news that Rotary has exceeded its fund-raising goal of $200 million. She also said the the Gates Foundation was so pleased that it will donate an extra $50 million over their matching commitment! She also donated a bottle of wine to be autioned off by our Club, with the proceeds going to Polio Plus. Suzi concluded with the note that we must continue to keep up the good fight. Although we are very close to eradicating polio, we must not stop our efforts until there are no more reported cases world-wide. From left to right, Mr. Harris, 2011-12 Club President Gerry Stacy, and Ms. Howe.